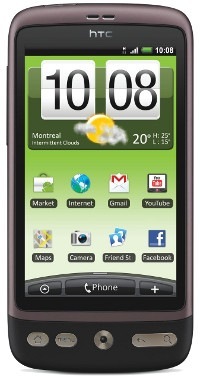 Telus is also throwing in an 8GB microSD card for good measure, and the device will be running Android 2.1 with HTC’s Sense UI. Can you spot the difference between Telus’s Desire and the original? HTC has apparently chosen to start using SLCD screens on the device in place of the AMOLED display the European version possesses, presumably to make sure production capacity is high enough (due to the AMOLED “shortage”). As with a number of other HTC devices, an update to Android 2.2 for the Desire will come later in the year. Pricing and availability have yet to be released, but it’s expected to appear sometime before the end of the summer. One last thing I should mention: the carrier is snubbing its nose at its competitors by stating that the Desire will be available “only on Telus.” How’s that for sand in the face? Dell Streak Tablet-Phone Headed To AT&T Stores Next Week?